Associate professor of electrical engineering Minjoo Larry Lee has been awarded $2,540,000 to develop dual-junction solar cells that can operate efficiently at extreme temperatures above 750 degrees Fahrenheit. 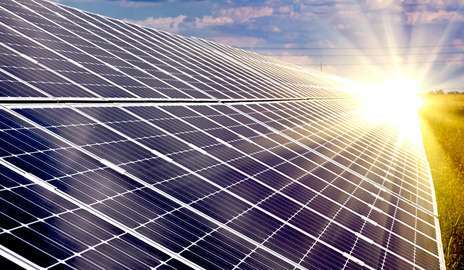 In addition to converting a portion of the sunlight directly into electricity, the solar cells will use the remainder of the light to heat high-temperature fluids that can drive a steam turbine or be stored for later use. "Our project aims to make a photovoltaic device that can operate at temperatures as hot as the inside of a brick oven," says Lee, who will collaborate on this project with Emcore Corporation and The National Renewable Energy Laboratory. "This is definitely high-risk research, as solar cells have never been run this hot, and they'll need to be both reliable and efficient at that temperature for a long time. But the potential payoffs are huge." Lee's project, sponsored by a grant from the U.S. Department of Energy's Advanced Research Projects Agency for Energy, builds on the technology of photovoltaic solar panels. However, while current photovoltaic panels efficiently convert part of the solar spectrum directly into electricity, they become significantly less efficient as they get hotter—an inevitable side effect of absorbing sunlight. Unlike traditional photovoltaics, which maintain their efficiency by dispersing the heat away from the panel or cooling the panel in some way, Lee's panels will be built from materials that can operate efficiently at temperatures far higher than the typical panel and will integrate with a solar thermal collector that absorbs the unused portion of the light spectrum and converts it into heat. The panels will use technology from concentrated solar power—a different method for capturing solar energy used in several large solar power plants—to transfer the heat to high-temperature fluids that can be used to power a steam turbine and generate electricity. These fluids can also be easily stored so that the heat energy can be dispatched when the sun is not shining or whenever electrical demand rises; this method of storing solar energy is more cost-effective than storing energy in batteries, notes Lee. "The current high cost of storing solar electricity in batteries, combined with the natural variation of available sunlight, will weaken the economic drive for photovoltaic market growth," says Lee. "Our project addresses both these challenges by taking the best elements of photovoltaic panels and combining them with the best elements of concentrated solar power." The project is funded by ARPA-E's Full-spectrum Optimized Conversion and Utilization of Sunlight (FOCUS) program.